In this issue of the Newsletter, we retell the story of a poetry writing competition, of sorts, between Shen-hsui and Hui-neng held during the early years of the Tang Dynasty. Our narrative is primarily based on the excellent translation by Philip Yampolsky of The Platform Sutra of the Sixth Patriarch. And we are very grateful to Professor James Miller of the Queen's School of Religion for recommending to us this wonderful book. The poems below have been translated by Lan Hua. In the words of Anaïs Nin “the role of the writer is not to say what we can all say but what we are unable to say.” At first, this sounds like a very modern conceit, placing the writer in a privileged and quasi-heroic position, as someone who dares to give voice to social or personal truths well before they become fashionable and commonplace. But in another way, Nin’s aphorism also aptly describes the role of the writer from time immemorial, even in more traditional cultures, long before the emergence of the avant garde. Whether among the Druids or Babylonians or Han peoples, writing, or more specifically, poetry grew out of spiritual practice and long served as an integral part of religion and ritual. As such, a poetic turn of phrase could be endowed with special or magical powers, and poems themselves were closely aligned with incantation and prayer. In traditional cultures, then, it would be just as apt to think of a poet as someone who gave voice to what most people were otherwise unable to say, much as was the case for the Bohemians in Paris. Nowhere is the deep connection between poetry and spiritual practice more apparent than among the Chinese, where the very character for poem is a compound word composed from two other root terms – those for word and temple. Over the millennia in China, great spiritual and poetic traditions emerged side by side and enjoyed a long and fruitful co-development. Most importantly, the foundational texts for Taoism, which were composed in a lyrical and elliptical style, provided a vocabulary and frame of reference that carried through the ensuing traditions of Tang and Song poetry, much as the King James’ Bible did for the flowering of English literature. And the same is true of Chinese Buddhism, particularly as it developed during the Tang dynasty. Poetry was often an explicit part of Chan religious ritual and practice. In fact, the Chan Buddhists of the 7th and 8th century transmitted spiritual leadership, by sometimes passing a robe, a begging bowl and a poem, from one patriarch to another, and thus enlightenment was formally handed down by verse. Furthermore, writing poetry could also provide a basis for selecting a spiritual successor, as was the case, at least according to legend, with the 6th Chan patriarch, Hui-neng by name. A fine poem indeed and ordinarily it might have sufficed to win the competition and secure for Shen-hsui the coveted position of 6th patriarch. However, the 5th patriarch was somewhat equivocal in his response to this first draft, suggesting that it showed Shen-hsui had as of yet failed to attain true Bodhi awareness, that he had arrived at the front gate, as it were, but not yet entered the arena. Instead of immediately deciding the issue in Shen-hsui’s favor, the 5th patriarch instructed the head monk to spend another few days thinking about what he’d written, consider making some revisions and then encouraged him to make another submission. Shen-hsui, however, proceeded to fall under the spell of a terrible writer’s block and struggled with his revisions. Meanwhile, quite by chance a young illiterate monk, who was just then working in the threshing room, happened to hear Shen-hsui’s verse as it was being recited. And immediately this illiterate monk, who was known as Hui-neng, understood the flaw in the head monk’s verse, how it reflected a failure on the head monk’s part to comprehend his own essential nature and was therefore devoid of cardinal truth. So, after asking to be escorted to the corridor where the head monk’s verse had been inscribed and otherwise intending to make proper obeisance there, Hui-neng made his way and found himself standing in front of Shen-hsui’s inscription where, upon hearing it read aloud again by a literate monk who happened to be standing nearby, Hui-neng immediately intuited the cardinal meaning and composed his own poem in response. With the help of the kindly literate monk, this poem too was inscribed on the wall alongside. 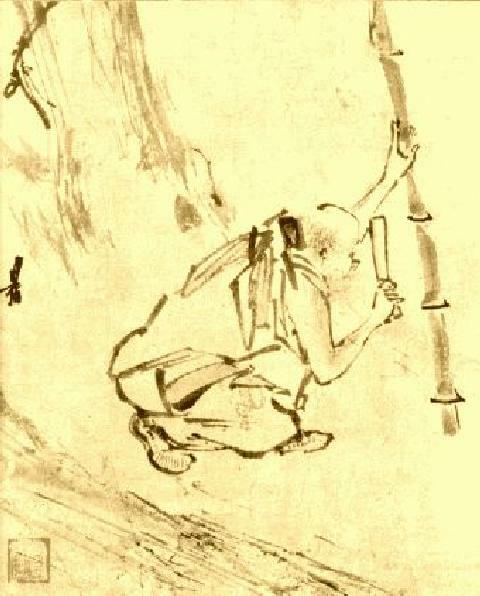 As further reported by Chan legend, following the transmission of the robe, Hui-neng fled into the night in order to avoid the jealousy and contumely of the other disciples. From that point on, while various versions of the 6th patriarch’s story have been handed down, the historical record is clear – Hui-neng subsequently emerges as the founder of the Southern School of Sudden Enlightenment and goes on to become perhaps the greatest spiritual leader in Chan Buddhism and, as the Chan tradition itself was transmitted across the South China Sea, eventually becomes one of the most revered figures in Zen Buddhism as well. All of which just goes to show the enduring truth of the epigram by Anaïs Nin with which we began this week’s newsletter. Whether illiterate or not, the writer’s role is to give voice to truths that most of us otherwise cannot. That seems to be a worthwhile goal indeed, however hard it may be to achieve. If you've enjoyed these poems and are interested in reading more, please sign up for our free bi-weekly newsletter and explore the other poems online at www.tangspirit.net. We'll be adding more to the web site soon, including audio files so you'll be able to hear the cadence of the original poems in Chinese. And please forward this email or link to any friends who may also be interested. The Tang Spirit web site has been developed as a joint effort by Lan Hua and Steve Zhang. Our goal is to help preserve and promote the spirit of Tang poetry. Whether you are new to Tang poetry or already an enthusiast, a student of Chinese or a lover of poetry, we hope you'll visit our site and find something of interest there.